France will continue to put airstrikes on positions of fighters of terrorist group "Islamic state" (YOKES) in Syria until it will be necessary, operating thus is completely independent. Such statement was made by the prime minister of the republic Manyuel Vals. 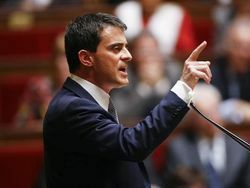 "The policy of France concerning Syria is a threefold hardness. Our policy is first of all military blows in Syria on positions of "The Islamic state" where the acts of terrorism directed against us" prepare, – he declared, acting in National assembly (the lower house of parliament of the republic). As emphasized the Waltz, speech in this case goes about the right to "lawful self-defense" France which sees threat of own national security in Islamists. "Prospecting flights were a prelude to blows which began this Sunday when our planes found and attacked the YOKES training camp, – he told. – We will continue to carry out these tasks so long as it will be necessary. Them we also will conduct at full independence of actions".